Reach some of the 3.7 billion email users. Resources to get you started in Email Marketing. Reach a worldwide Internet audience on computers, tablets and smartphones. Expect half the email traffic to be read from tablets and smartphones. Create a customer persona for your ideal customer. What do they want? What is the biggest customer frustration that your products and services solve? Create a lead magnet to help solve this issue (see table below). 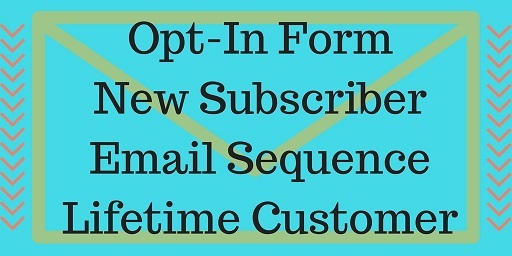 Add an Opt-In web form to gain an email address for the lead magnet. Content Upgrade - Create a specialist Opt-in and lead magnet to further support a specialist web page. Their email address will unlock your valuable content. Survey you email list for preferences, topics, issues and content suggestions. Add a landing page Opt-In link in your email signature block. E.g. Free course, free checklist. Host a Webinar and collect email addresses at registration. Be a guest for an interview and use a Landing Page URL opt-in for more information. Update your social media training for the platform where your customers frequent. Share an opt-in link. Email people one by one who would likely be interested in the lead magnet. New client purchases follow up welcome email. Ask to follow on social media. Abandoned cart email. You can offer a discount. Post purchase follow up email. Ask for a review. Display complimentary products. Link to FAQ. Re Engagement email. Upcoming sale. Free product sample. 10% off next purchase. Trial premium feature offer. Offer free products if spend is over a threshold. Educational content to build trust. Product best practices, frequently asked questions, maintenance. Segment clients by purchase history and send relevant offers. Segment email list by customer segment. Optimize emails for mobile email users. Social media sharing of emails. Remarketing - Send reminder emails to purchase. Offer multiple channel interaction. E.g. Phone, chat, web form, email, social media. Lead nurturing and scoring - Track who clicks links in email and increment their score. Enticing enough to get the user to open the email. Emotive, convincing, short and clear. Convey the theme and prupose of the email. Create common ground with the reader. Header email address, Subject, Attachments, Body, Call to Action, Closure. Include images. Last sentence to promote produsts and services. Professional signature block with contact types and social media sharing. Segment targeted email have higher conversion rates. Customer Relationship Management or Smart Tags can be used to segment email list. Time to start planning your Lead Magnets, Opt-In Web Pages and Email Sequences. See Opt-In below for website development. Keep up to date to leverage teachnology change.